How Can I Speed Up My Testing Lab Routine Analysis 25-fold? Find out how application of SIFT-MS technology can deliver competitive advantage in your laboratory because of high sample throughput and its ability to analyse chromatographically challenging species. Conventional laboratory analysis of volatile compounds typically utilizes chromatography-based techniques, which are slow and frequently require extensive sample preparation. By utilizing soft chemical ionization, SIFT-MS provides direct, rapid sample analysis with no or minimal sample prep required. When coupled with autosampler technology, SIFT-MS yields very high sample throughputs (in excess of 100 samples per hour), including for challenging compounds like ammonia, formaldehyde, and hydrogen sulfide. Very high-throughput headspace and gas analysis provides new opportunities for both contract and R&D laboratories serving a range of industries, from environmental monitoring to food testing to pharma. It can also speed up method development for traditional techniques. 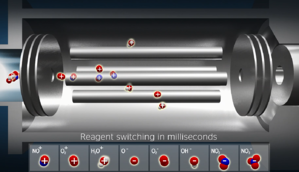 The fundamentals of the selected ion flow tube mass spectrometry (SIFT-MS) technique, including its ability to selectively and comprehensively analyse samples in one simple procedure. How automating SIFT-MS analysis can revolutionize analysis of organic and inorganic volatiles, delivering competitive advantage through time and cost savings. How automated SIFT-MS turns headspace techniques that are cumbersome with chromatography (e.g., multiple headspace extraction) into practical, economical methodologies.